Hyundai is set for all-electric version of its famous i10. 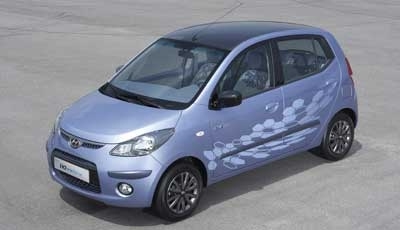 It has unveiled its i10 Electric version in Auto Expo, 2010 at Pragati Maidan , New Delhi. It has a 49 kWh electrical motor and a 16 kWh battery, and uses advanced LiPoly (lithium-ion-polymer) technology. The low kerb weight and evolved battery technology gives the i10 Electric a driving range of 160 km on a single charge, with a top speed of 130 kph. This car offers dual recharging cycles. Charging through a 220V outlet is estimated to take approximately five hours for a full charge. With a 413V outlet, an industrial strength current, the battery can be recharged up to 85 per cent of its capacity within 15 minutes. EVHUB.BIZ hosts "Online Showroom" for E-bike dealers , Service centers, auto spare parts suppliers. In online showroom, you can exhibit your product photographs , service information along with contact details so that costumers can contact you directly.